Weddings are surely about gaudy dresses and sparkle, but one thing that can totally turn heads is the right way of flaunting wedding accessory. Even the simplest of the looks can be accentuated with the help of these accessories. Every bride is beautiful but embellishments ensure that you look like a princess on your special day. It is the manner of flaunting wedding accessory that allows you to express to the world about the kind of woman that you are- sophisticated, smart or even bold. Brides nowadays are seen experimenting more and more with the accessory that would go best with their wedding attire. While accessories are important to supplement your style, it is the manner of flaunting wedding accessory that can actually add life to your wedding look. Maang Tikka is one of the most widely worn Indian wedding accessories that adorn the forehead at the parting in the middle of the hair. This particular accessory can go with any kind of wedding attire. But to flaunt it, one can opt for a tikka larger in size, encrusted with coloured stones, large beads, kundan, polka or pearls. But make sure to keep your other jewellery at a minimal to attract the attention towards this beauty at the centre. Passa is nowadays worn the most when compared to a simple, straight maang tikka. It is an ornament similar to that of a maang tikka but is worn at the side of the forehead rather than the center. You can even choose to wear a passa at the side along with a simple tikka at the centre. This accessory has a Persian vibe to it and can be spotted with anarkali suits and almost all the wedding lehengas. Matha Patti is a maang tikka with an elaborate headgear that covers almost your entire forehead. This look can go best if you wedding attire is a saree, especially a Bengali one. Bindis can come in various forms and sizes studded with pearls, stones and beads and can be matched in colour with the particular outfit you’ve been wearing. You can also pair it with a maang tikka to accentuate your look but special attention needs to be given to its correct size to flaunt it. Crown/Tiara is a rather modern concept in the field of accessories. 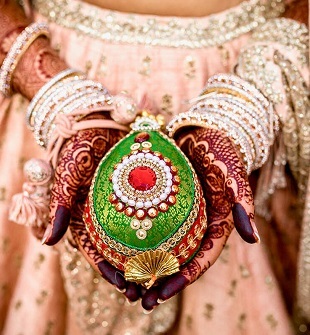 Most of the Christian and Indian brides are seen flaunting this particular accessory today. 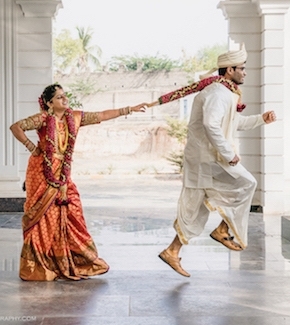 For an Indian bride, it can go best with an Indo-Western outfit. If your nose is your special feature, why not highlight it with an accessory? And that’s where we have the Nath or Nose Pin, a delicate stud or gold ring with an attached chain connecting your nath to the earring. While most commonly worn with a Bengali wedding attire, you can also spot this look with almost all the wedding lehengas by pairing it up with a matha patti for the perfect flaunt. This wedding accessory serves a twofold purpose- It can add look to your attire and also hold your outfit in place. It is like a sash or belt made of gold or other metals, studded with beads or pearls and goes around your waist. If not a gaudy kamar patta, you can also opt for a waist chain, more like an extended version of the anklet to add life to your attire. This look can be best spotted with a saree but you can also use a chain with a tassel suspending at the end of it to flaunt it with a lehenga. You can decorate your entire hair length and the crown with the help of Metallic Pins that are available in different designs. Usually, hair accessories can be flaunted the best when your head is either uncovered or semi-covered. Veils are the most traditional and a must accessory in Christian weddings. You can choose the length and type according to your wedding gown for a perfect flaunt. Broaches go the best with a South Indian Wedding attire adorning your hair on both the sides in the shapes of moons and stars. 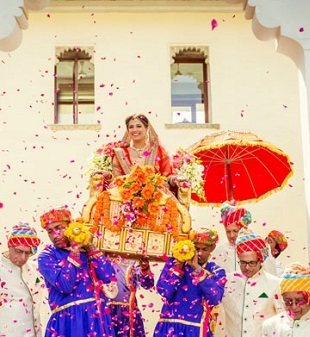 North Indian Brides can flaunt their Paranda– a coloured tassel at the end of the plait by opting for various designs and colours as per their outfits. 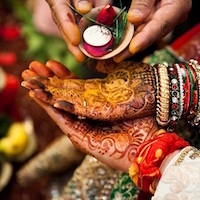 Rings are one of the most graceful and significant wedding accessories in almost every community. Hence the utmost need to flaunt it in an equally graceful and sophisticated manner. You can choose to show it off with your Mehendi covered hands. Trust me, every bride can pull this look. You can also flaunt it by attaching it with a Medallion that covers the back of your palm with a chain. You can also opt for a perfect Manicure or Nail Art studded with beads and stones to suit your ring-flaunt game. Your wedding dress may be the star of the show but a good combination of accessories can definitely add life to it. Hence it is imperative to give equal importance to flaunting wedding accessory in accordance with the particular outfit that you choose to present yourself in on your special day. This will make flaunting wedding accessory the most enjoyable task of the occasion.